Jaguar Land Rover has halted work at its car plant in Castle Bromwich, central England, for two weeks. 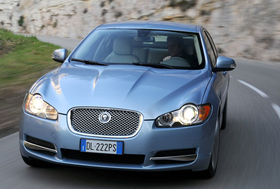 The Castle Bromwich factory makes the XJ upper-premium sedan, XF medium-premium sedan and XK premium roadster. Production at the site restarted on January 12 after an extended three-week Christmas shutdown, but stopped again because of lower sales demand. Don Hume, Jaguar Land Rover spokesman, said workers were still in the factory carrying out training for the new versions of the XK and XF, which are due to be launched next year. "The production stoppage is also because of the economic climate to allow us to adjust production to meet demand," Hume said. Production at Jaguar Land Rover's other two plants in the UK is unaffected. "We anticipate production at Castle Bromwich getting back to normal after this two week period," Hume said. "We will continue to review the situation." Union representatives have met with Jaguar Land Rover management to discuss ways of cutting costs at the carmaker without further job losses. Last week, JLR announced a further 450 job cuts in its bid to overcome the global slump in car sales and the credit crunch. JLR has so far cut 1,850 jobs including those of 850 temporary agency staff.